A product may be “eco” – that is, economical, ecological, good value and at the same time stylish and “chic”. 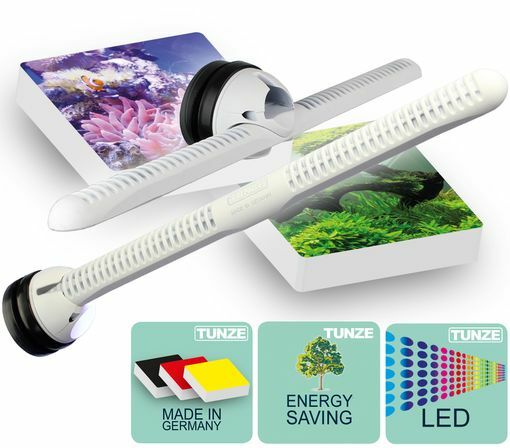 The new TUNZE® LED lights for fresh water and sea water combine both attributes in highly effective and perfectly designed lighting for aquariums at a very reasonable price. The eco chic LED lights with protection class IP 68 operate permanently in the air but also under water. The special manufacturing process doesn’t just guarantee the water resistance, it also enables the permanent underwater operation which also relieves the pressure on the aquarium heater. This underwater lighting avoids light reflections on the water surface making the lighting source even more efficient. An immersion depth here of 1 to 2 cm is more than adequate. A compact housing has been developed through the use of the latest components. This can be attached flexibly using the Magnet Holder. Operation with extra-low safety voltage ensures risk-free underwater use without electrical losses. The built-in overheating protection as a safety function ensures that the performance of the lamps is gradually reduced from 10 W to 7 W at temperatures of approx. 25°C (77°F). Care Bacter 0220.005 - A Miracle Solution for Your Aquarium?